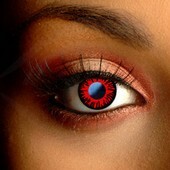 Create a Halloween look with Twilight Breaking Dawn Contact Lenses. These red twilight vamp contact lenses have a 'realistic' coloration with deep red and dramatic black detailing. They look just like a newborn vamp or one of the bloodthirsty Volturi. Dream Eyes Contact Lenses make it easy to create an amazing costume. 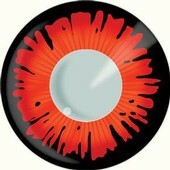 These lenses include bright colors; natural look designs and classic movie looks. Dream Eyes contact lenses are light, soft and comfortable to wear. Their 42% water content ensures that your eyes stay hydrated and feel fresh all day.